One of the really cool things happening right now in my Advanced Computer Instructional Development class, is that all of us have the opportunity to read about the research interests of everyone else. One of the topics that we just recently spend time discussing was financial literacy, and the article that I really dug into had some very interesting implications. This article looked at a group of high school students who took a financial literacy class and compared them with students who did not. The results were interesting. Those taking the financial literacy course performed equally as well on a financial literacy questionnaire (sometimes worse) as their counterparts who did not have a high school financial literacy class. How was the financial literacy course perceived? What students took the course? Were the materials and lessons effective for communicating and teaching the course goals? Was this a year long or semester class? Looking at how financial literacy has been taught in the past, students typically did not have a positive view of these kinds of courses. 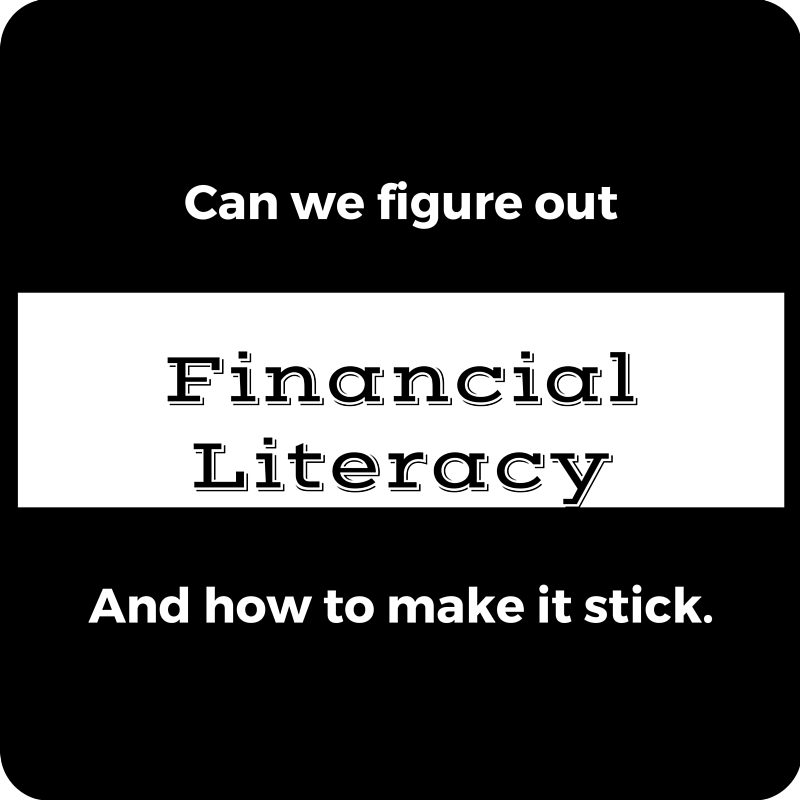 Financial literacy was something to take to get credits for graduation, sort of a blow off class, or a class for those who really struggled with math….This is an area where there needs to be a change in perception. I’m not sure that mandating financial literacy is the way to go, there are so many things that schools are required to do now. Things that are not funded but mandated and expected…. There are a variety of different financial literacy options available to students and adults. I believe that an understanding of how money works benefits an entire community and not just those specific people who participate in the learning. My own journey through financial literacy stems from choices I made as an adult to get educated – I had basic checkbook accounting skills when I was in high school. It wasn’t until I was older and had recovered from some difficult financial circumstances that my wife and I worked to understand financial matters more completely. She signed us up for Financial Peace University (I didn’t want to do it…). Thirteen weeks later, we were completely debt free, both cars paid off, students loans paid off, and we were making bigger mortgage payments than we thought possible. I would strongly recommend this course to every teenager and adult – it was amazing. Fast forward five years and we have a six month nest egg, retirement plans that are averaging over 10% growth each year (including the recession), and a stability that we had not ever experienced. Maybe these lessons were stronger because of mistakes that were made. Maybe these lessons were stronger because I had experience trying to manage money from a paycheck. It is interesting to reflect on my journey through this. I am not sure a financial literacy class in high school would have benefitted me at all, I had no experience trying to manage money. It was a situation where my parents gave me some help, but I needed to live this part of life first. Maybe financial literacy would be better suited in college, where students have some experience managing money. I don’t have too many answers here….